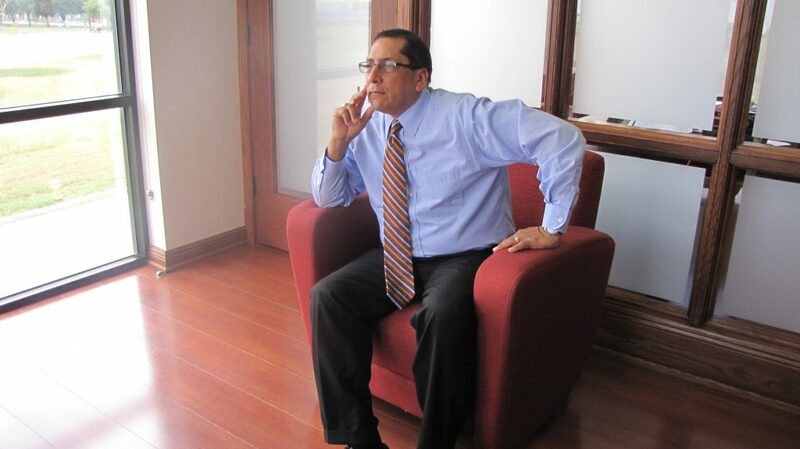 Abe Jaquez became the eighth president of Baptist University of the Americas. He wants BUA to provide educational opportunities for students who “for a variety of reasons may not be able to attend other schools.”SAN ANTONIO—The vision some Texas Baptists had for the school now known as Baptist University of the Américas has changed since its creation in 1947—not a reversal but an expansion.Sixty years ago, Baptists in San Antonio founded the school to train Mexican-Americans for ministry. Today, BUA prepares people from varied backgrounds to serve the cause of Christ in a multicultural context.The institution San Antonio Baptist Association created as the Mexican Baptist Bible Institute went through several name changes through the years. It became Baptist University of the Américas in 2003, when it began offering bachelor’s degrees. BUA now offers five Bachelor of Arts degrees and one Associate of Arts degree. But for Abraham Jaquez, new things are just beginning at the school. Last month, Jaquez became the eight president of BUA. He previously was executive director for Buckner Children and Family Services in Dallas. “Our goal is to educate bilingual and bicultural students,” Jaquez said. A significant segment of the population in Texas has been ignored—young Hispanic Texans who must choose between education and providing financial support for their families, he observed. BUA exists to provide an opportunity to students who “for a variety of reasons may not be able to attend other schools,” Jaquez said. And its goal is to train “Hispanic pastors who had the time to study and have the tools that education provides,” he added. Many Hispanic churches have relied on ministers who lacked the necessary education or preparation, he observed. About 60 percent of the Hispanic staff in churches across Texas attended BUA—a hopeful sign for a school that has been a university just 14 years. But Jaquez insists BUA still has a lot to learn. Jaquez knows challenges are on the way, and BUA can be prepared to meet them. San Antonio and Austin are growing—expanding toward each other to form the next Texas metropolis. With the presence of Convencion in San Antonio, Jaquez believes BUA is strategically positioned and poised to be a great partner as a hub for Hispanic ministry in Texas. But its focus is not solely on Hispanics. This semester, 238 students are enrolled at BUA, and Jaquez wants to be close to them and connect with their needs. That’s why he and his family live on campus, he noted. BUA receives many international students—not only from Latin America, but from other parts of the world. So, Jaquez and the rest of the faculty and staff at BUA recognize the education they provide as an investment in churches around the globe. Whether it is in Texas, or in Mexico, or in South Africa, BUA wants to “provide church staff and leaders around the world,” by educating students who come from those places, Jaquez said. Interaction with churches must not wait until students graduate, Jaquez added. BUA must partner with churches so pastors who are already mentoring and guiding young leaders can confidently recommend BUA to those seeking guidance about their future. BUA wants to be a school for people who want to become leaders of churches that need leadership, Jaquez said.